There was a surprising amount of flesh on show from the 26 players taking part this year, given the November date. But the unseasonably warm weather meant that fleeces and tracksuits were discarded on court almost immediately, and certainly made the journeying between the two Clubs very pleasant. Play began with eight round robins: five for Division 1 at The Oratory; and three for Division 2 at Hardwick. There were three players in each group, playing first to 8 games, with a 35 minute time-out, so a number of closely- fought matches never made it to the full score. At the knock-out stage, games were played first to six, with no time constraint. At the round robin stage, only five of the fifteen matches went the full course in the allocated time: a good indication of the competitive play. Some surprising players went out at this stage. Gabrielle Smart, smart by name and smart by play, normally sweeps through the first round, but had fierce opposition from Georgiana Seigneur and Amy Pye; and Katie Leppard of the terrifying leftie railroad was denied a place in the knock-out by Rebecca Kashti and Linda Fairbrother in her group. That left ten players. They included Mary Joyner, a newcomer to LRTA tournaments, but whose Lawn Tennis ball skills were very much in evidence; and a good contingent of young players, including Hattie Hamilton, Charlotte Barker and 16-year old Amy Pye. Most matches at this stage were clear results with one player more or less dominant. The closest match, however - in the quarter-finals - was between Rebecca Kashti and Georgiana Seigneur – a stately affair exchanging cross-court shots, with neither hitting very hard but going for position. At 5/5, it continued even-stevens to 30 all. Rebecca then laid two chases to get the serve. Georgiana just lost the first one (worse than 4), and then lost the second (worse than 5) by an even smaller margin, a mere whisker. So, Rebecca went through 6/5. By the semi-finals, it was two ‘oldies’ versus two ‘youngies’. The first semi was Amy Pye against Linda Fairbrother. Amy had been improving with every match, hitting ferocious ground strokes and making very few mistakes. Against Linda she struggled at first, as the more experienced player mixed up her shots, played short or high, or up the sides, before throwing in the occasional zinger. Linda went ahead 4/3, at which point Amy settled down, “formed a plan” as she said afterwards, and began to impose her game on things, refusing to be spooked any more by strange shots from her opponent. She went on to take the set 6/4. In the second semi, Rebecca Kashti faced Charlotte Barker, both playing steady strong ground strokes and serving well, with a very similar handicap. The match was more a matter of who made the errors, with nearly every game going to 40 all. At 4/3 40/30 to Rebecca, Charlotte did a beautiful lob over Rebecca’s head to win Chase the Line, but then lost the next point and the game, to make it 5/3. Heartened by this, Rebecca sealed the next game, and the match, 6/3, with an overhead backhand volley - smack under the grille! The final match was therefore between Amy and Rebecca, with a handicap of 5 points in Amy’s favour, which was quite a task for Rebecca to overcome. She didn’t really have a killer shot to hurt her opponent, so had to depend on good serving and accuracy of placing. Any loose shots were hammered by Amy into a corner, so there was a lot of pressure. Amy’s resolve was exemplified at 4/2 40 all. In the middle of a rest, she lost her balance, dropped the racket which skidded away six feet or so, but she scuttled over to it, picked it up, and actually hit the next ball. Into the net, of course, and losing that game, but the applause from the dedans must have been bitter to Rebecca’s ears, confirming that Amy was not going to give up, whatever ammunition Rebecca threw at her. 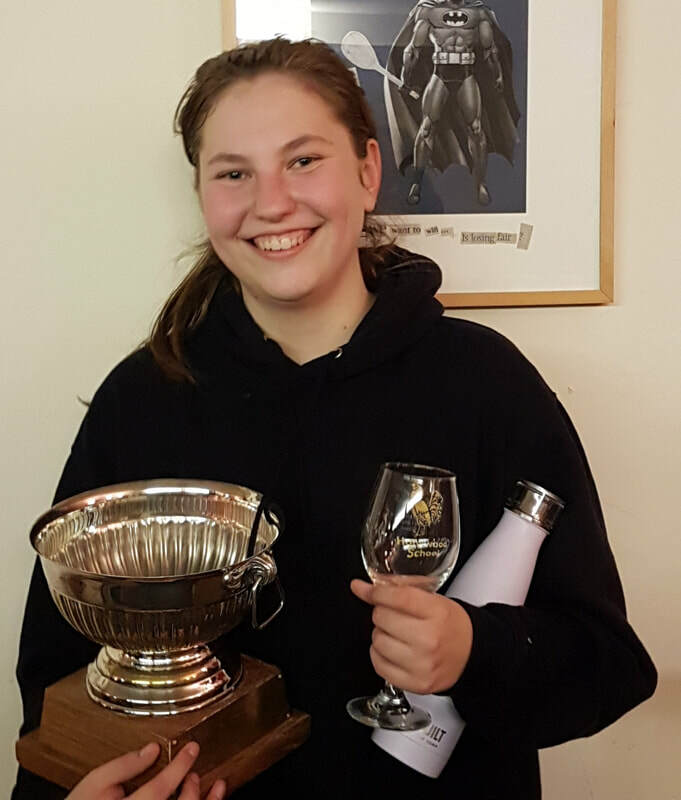 And so it proved – Amy won the Final 6/3, a fine effort for the teenager from Prested. 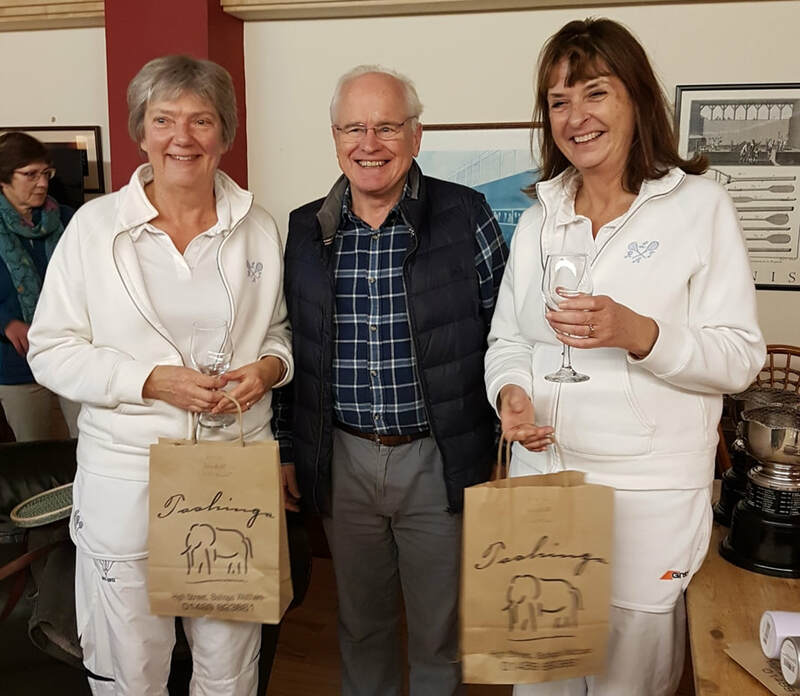 There were six pairs playing Div 1 Doubles, starting in two round robin groups playing first to eight games, with winner and runner-up in each group going into the semi-finals. In the first group, Hattie Hamilton & Sarah Parsons won both their matches, with steady solid shots and the helping hand of quite a few service nicks in their favour. Annabel Wyatt & Elaine Wright found their play too hot to handle: “I’m only here for the wine”, proclaimed Elaine at 7/3, though she and Annabel held on to make it 5/8. And against Felicity Sargent & Charlotta Ginman, Hattie & Sarah’s strategy of peppering Charlotta mercilessly until she capitulated was highly – if cruelly - successful, only allowing their opponents three games (who went through, however, as Runners-up, having beaten Annabel and Elaine 8/3). The second group had a formidable pairing in Katie Leppard (whose railroad was now working perfectly) & Mary Joyner. Not surprisingly they won both their matches. 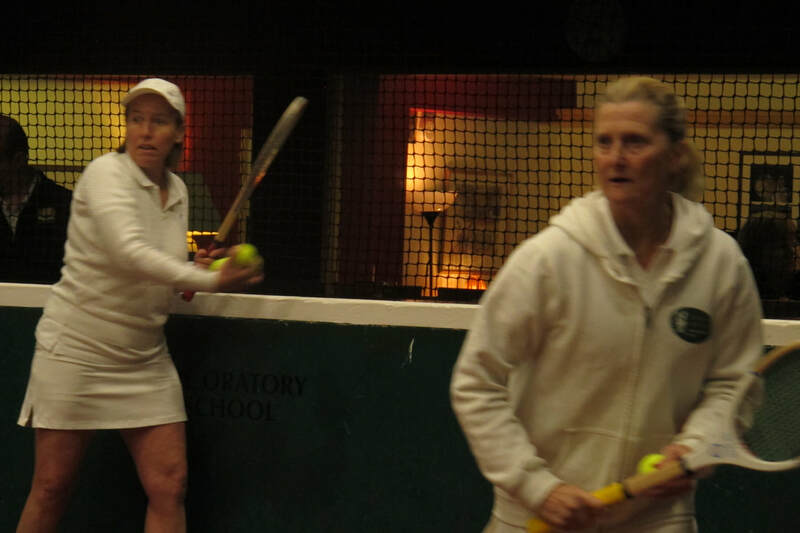 First, they took on Candida Nicholls & Linda Fairbrother, in a match full of hard hitting and volleys. The score was level up to 5 all, at which point Katie began to hit even harder balls (if possible!) and she and Mary surged ahead to win 8/5. Candida & Linda then had another nip and tuck game against Charlotte Barker & Amy Pye, with the former pair doing their best to aim all shots at Charlotte to avoid Amy’s bullets. At 6/5 to Candida & Linda, the allotted time was up, so Amy & Charlotte were beaten by the clock. The final Round robin match, between Katie & Mary against Charlotte & Amy, was a thrilling affair, going to the wire. Charlotte & Amy went ahead to start with, as Amy played deep and low into the corners, getting them to 4/1. But the other pair began to attack Charlotte’s backhand, and crept up to level at 7 all with just minutes to go, and Amy serving. Katie, receiving, tensed up and it was 30/0 to Amy. Then Amy tensed up with two loose serves, allowing Katie to find the dedans – 30 all. At 40 all, match point, Amy rushed across court to poach a loopy ball from Charlotte – but both players missed it, so it laid a Chase. The Chase was played – and called Off! 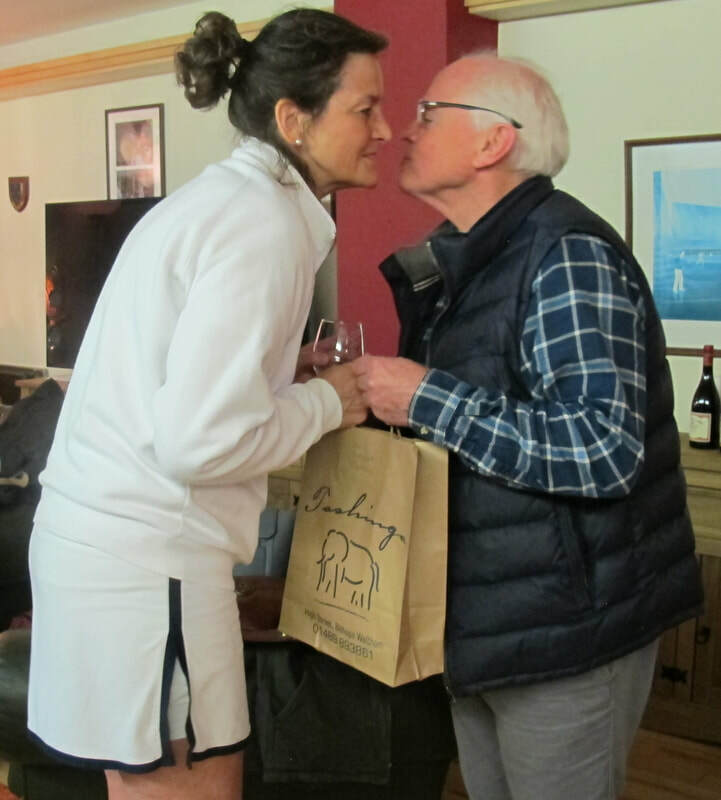 Another match point – but this time, Katie & Mary won it in the last seconds of time, 8/7. Most unfairly, really, given the closeness of this match, the second defeat of Charlotte and Amy meant that Candida and Linda went through as runners-up in the group. The semi-finals and final were 6 game sets. The first, played between Sarah Parsons & Hattie Hamilton against Candida Nicholls & Linda Fairbrother, saw Sarah & Hattie eating up any strong low ground strokes, putting pressure on Candida & Linda to either do perfect hard shots or use the wings and corners with spin. Many games went to 40 all, but the steadiness of Sarah and Hattie got them through 6/3. Katie & Mary against Felicity & Charlotta was enlivened by a freak (one supposes?) shot by Charlotta high on the tambour that then went into the Winning Gallery. Much applause! The games continued with excellent rests and volleying, neck and neck, till it was 5 all, with Katie serving the final game, looking totally focussed, till it was 30/15 in Katie & Mary’s favour. At this point, Katie served two railroads, neither impossible to return, but under the pressure good enough to make Charlotta put both in the net – 6/5 to Katie & Mary. In the Final, Sarah & Hattie’s game plan seemed to be to go for Mary whenever they could to avoid Katie. As a result, a splendid dance ensued as Katie & Mary swopped sides to thwart the plan – usually very successfully. Both also were equally keen to lunge for mid-court volleys, and extreme injury was only just averted a few times. But it proved successful all the same in winning points. 4 all, and then 5 all. At 30/15, a winning gallery shot by Mary took her partnership to 40/15. A chase followed, which they lost, but the next point gave Mary and Katie the match and Final, 6/5. Three round robin groups played to go through to the knock-out rounds, with three players in each group playing first to 7 games. Handicaps were capped at 70. Much cheer on offer at the sight of veteran Lucy Davies playing singles – not her forte, as she herself proclaimed, but she stepped up to replace a dropped-out player at the last minute. Her first match did not go very well – “Almost a rest!” she proclaimed at one point after a brief exchange of shots. But long years of play, and fine-tuned cunning, gave her a very popular victory in her second match which she won 7/1, to balance the 1/7 loss of the first. She went through as runner-up in the group; Sarah Lambie won both her matches and so was the group winner. 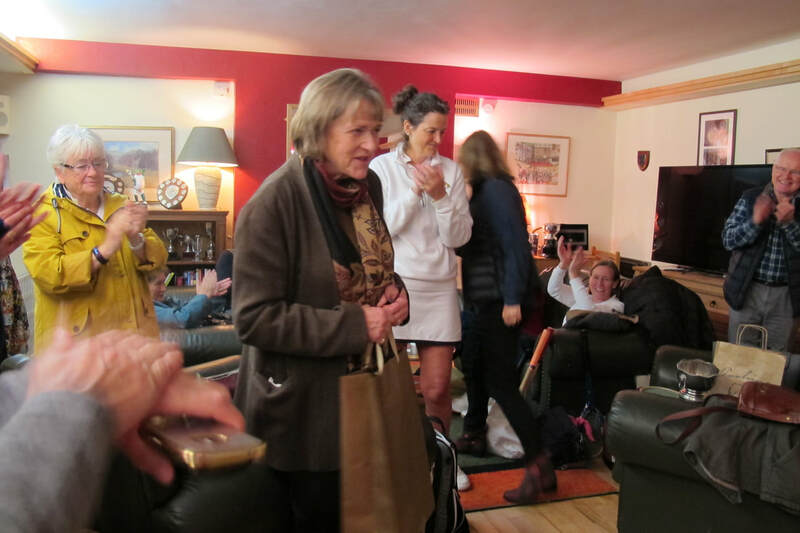 Rosie Law and Di Wilson were the respective winners in their two groups, with Sarah Sullivan (giving lots of points in her matches) and India Deakin going through as the remaining runners-up. Lots of excitement in the knock-out matches at Hardwick on Sunday morning – so much adrenalin, in fact, that Adam Phillips the marker got attacked three times by different servers – allegedly by accident. But maybe it was revenge for his terrifyingly loud calling of serve faults. Apart from that, the 6 players still in the running had some great matches, with the quarter-final between Rosie Law and India Deakin particularly close, going to Rosie 6/5, who went on to another excellent match against Sarah Lambie, which Sarah won 6/3. 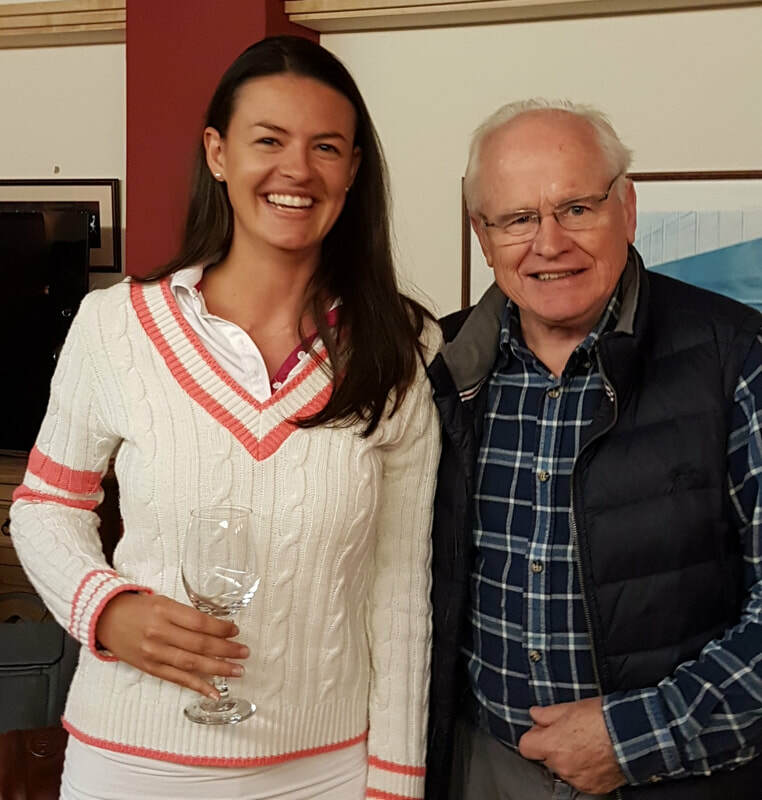 In the other semi-final Sarah Sullivan, after beating Lucy Davies, met Di Wilson who was playing extraordinarily consistently throughout the tournament, putting great pressure on her opponents by almost error-free performances. And so Di continued in this match, beating Sarah 6/3. 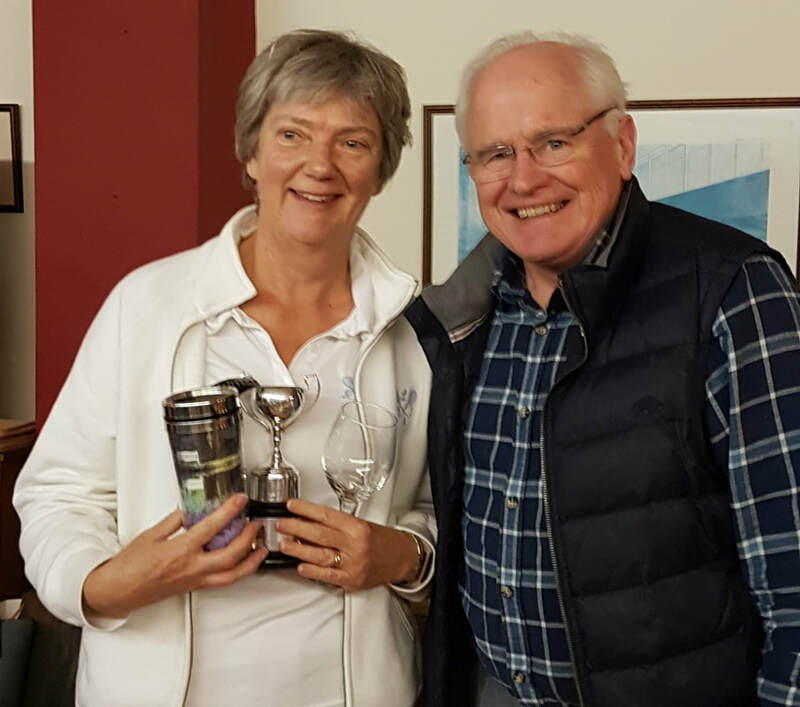 In the Division 2 Singles Final, Di Wilson met Sarah Lambie, with a handicap of 5 points in favour of Sarah (who was capped at 70). There was steady play by both players, playing high shots for safety over the net. Di maybe made more hay when she got the opportunity, stepping in to finish the point with good accuracy, getting to 5/3. But she didn’t have it all her own way – at this point Sarah tried to spook her with looping shots sent with spin, so Di would line up, expecting easy pickings, only to see the ball spinning out of reach. But Di stayed resolved, sorted things out, and went 40/30 up match-point. A chase of Hazard half a yard got her to the service end, where she played a high shot to the tambour which fell against the back wall and gave her the match, 6/3. Seven pairs played in Division 2 doubles, in two initial groups playing to six games. 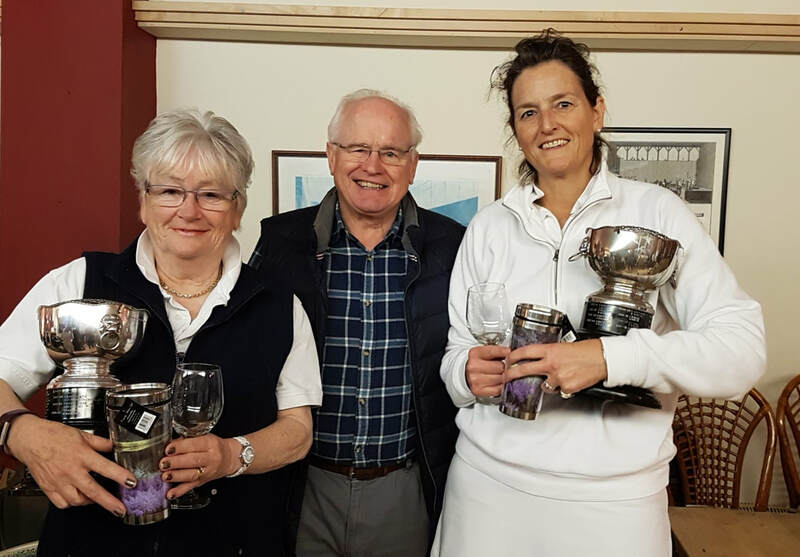 The pair apparently on form in the round robin stage were Rebecca Kashti & Pam Tomalin, who won all three of their matches, so all eyes at Hardwick were on them in the first doubles of the knock-out stage. They met the two Lucys – Davies & Hutchinson. Not surprisingly, all balls coming from Rebecca & Pam were aimed squarely at Lucy Davies. She has a great talent for returning every ball in cunning fashion, but would be the first to admit she can’t run very much anymore. It was a good strategy for Pam & Rebecca, who took the match 6/1. The other semi-final was between the established pair Rosie Law & Di Wilson against Katy Doy & Sarah Lambie. This was a much closer match but won eventually by Rosie & Di, 6/5. In the Div 2 Doubles final, Rebecca & Pam took on Rosie & Di. The former pair took a lead from the start, their powerful shots overcoming the steadiness of Rosie & Di, who fought gamely but couldn’t quite handle the low corner placing of their opponents. It was 4/2 and then 5/2 to Rebecca & Pam. Di & Rosie kept fighting, and with some careful placing of balls, managed to get another game to make it 3/5. But Rebecca & Pam were just too dominant and sealed the win, 6/3. 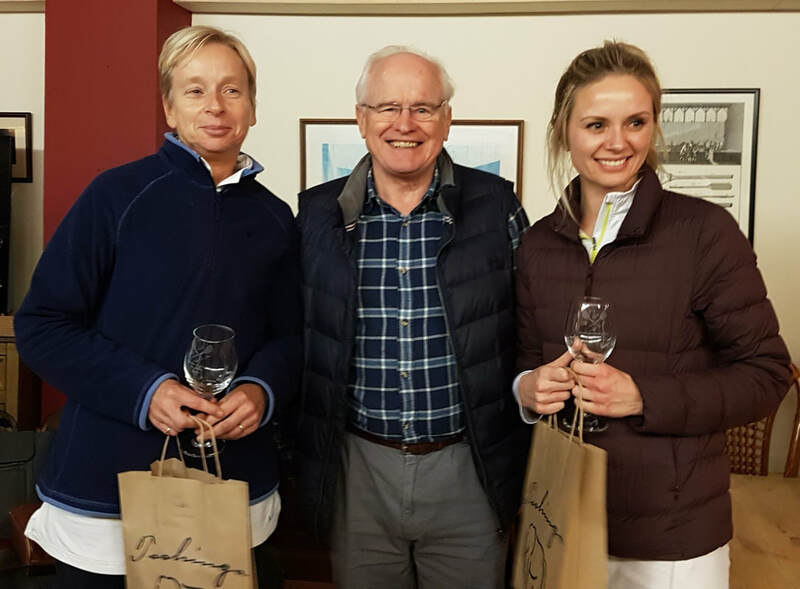 Thanks to The Oratory and Hardwick for hosting this tournament as well as the two previous British Handicaps – we have very much appreciated the help of the two Clubs, the participating professionals and the Club members during the last three years. Thanks to Marc Seigneur and Adam Phillips for their splendidly accurate and good-natured marking; to Tim Tomalin for presenting the prizes, Lucy Hutchinson for helping in the organisation, and above all to Katy Weston, who has been in charge of this tournament superbly for so many years, but is now standing down for a well-deserved ‘rest,’ as she moves on to a new phase in her life as an Anglican priest. We wish her the best for the future, and of course still hope to see her on court.